Apple’s Mac provides built in Automator Application to create Scripts and Automate Workflows. The Automator Action presented here allows you to add Mouse Clicking, Mouse Scrolling, Keyboard Typing and other related functions to an Automator Workflow. The Mouse Clicking done by this Automator Action is done on the basis of Screen Co-Ordinates and hence with proper planning, you can automate any type of Application, WebPage, Online Game or anything else on your Mac running 10.6 or later version. 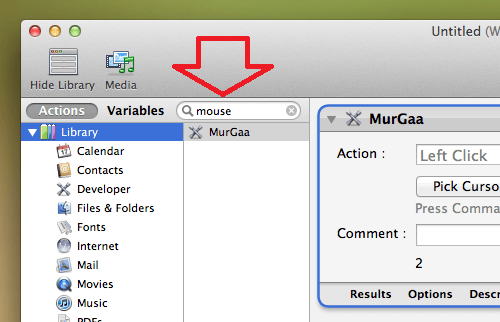 The above screenshot displays main screen of Automator Action to do Mouse Clicking from Automator Workflow. Left Click, Middle Click, Right Click, Mouse Scrolling, Moving Mouse Cursor, Text Typing onto Active Application Window and pressing return Key on Keyboard is currently supported by this Automator Action for Mac. This Automator Action is provided on a Free to Download and try basis and requires one time registration fee of $10.00. 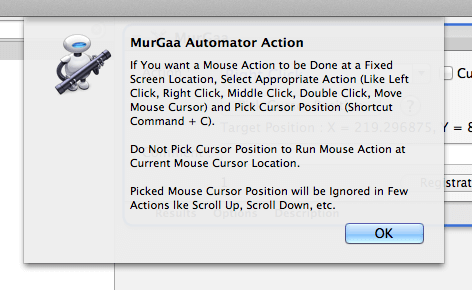 Download this Mouse Clicking Automator Action on your Mac running 10.6, 10.7, 10.8, 10.9 or 10.10. You can also watch a Video Demonstration which displays how to Install and Run this Automator Action and finally add Mouse Click feature in your Automator Workflows. Appropriate help is included in the Graphical User Interface of the Automator Action itself with the help of Help buttons and appropriate description in the Automator Action itself. Yes there are other ways as well in which you can Automate Mouse and Keyboard Actions of almost any type. 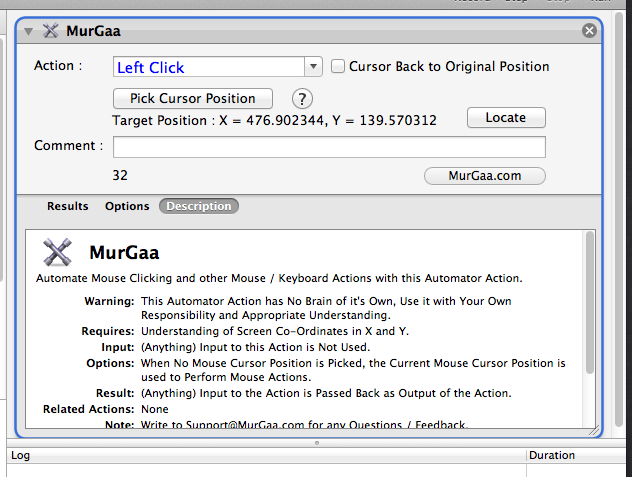 Whether you need to Record and Playback Mouse and Keyboard Action, do Fast Clicking at a single location, or even create a Macro Script to run on your Mac, you can visit MurGaa.com and select any other appropriate Mouse and Keyboard Automation Application. 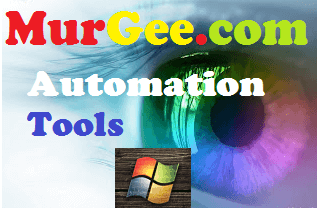 The Automator Action presented in this post allows you to embed Mouse Clicking in your existing Automator Workflows and on the other hand side, the Automation Tools dedicated for Automating Mouse and Keyboard provide you dedicated functionality.